This chapter is a synthesis of new knowledge, procedures, best practices and references for collecting plant diversity since the publication of the 1995 volume Collecting Plant Diversity; Technical Guidelines, edited by Luigi Guarino, V. Ramanatha Rao and Robert Reid, and published by CAB International on behalf of the International Plant Genetic Resources Institute (IPGRI) (now Bioversity International), the Food and Agriculture Organization of the United Nations (FAO), the World Conservation Union (IUCN) and the United Nations Environment Programme (UNEP). The original text for Chapter 7: Classifications of Intraspecific Variation in Crop Plants, authored by P. Hanelt and K. Hammer, has been made available online courtesy of CABI. The 2011 update of the Technical Guidelines, edited by L. Guarino, V. Ramanatha Rao and E. Goldberg, has been made available courtesy of Bioversity International. 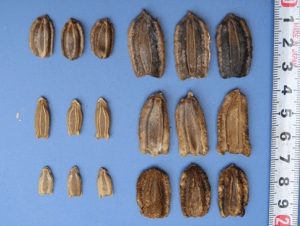 Considerable intra-specific morphological variation in bottle gourd (Lagenaria siceraria) can be seen in fruit and seed size, shape, degree of development of the handle and shell thickness. The species was possibly the earliest crop to be domesticated by humans for use as a container that is light yet strong. Infraspecific classifications are discussed as useful tools for the plant collector. Whereas formerly many different types of such classifications have been proposed and used, today we have relatively few modern examples. The reasons for this are discussed. In light of the general development in biodiversity, we should expect classification to take on greater importance, which would correspond to the often demanded increase in the importance of taxonomy. Germplasm collectors must be thoroughly familiar with what is known about the variation present within their target taxa if they are to sample them efficiently. In crops, this variation can be many times greater than in wild plants, especially for species that were domesticated early and have been widely spread around the world. Such variation is the result of both natural and artificial selection pressures. The latter may be conscious or unconscious and result from the application of diverse agricultural practices and from the disparate and changing demands of growers for specific agronomic and other properties. Variation may be in morphological, anatomical, karyological, ecological, physiological, biochemical and molecular characteristics. Explanatory surveys of genetic diversity can be useful preliminaries to germplasm collecting (von Bothmer and Seberg 1995). Most relevant for the collector in the field, however, is variation in morphological traits and ecological adaptation. Making use of a scheme for the classification of the morphological traits can help collectors to keep track of what they find and to compare the diversity of different areas (Moss and Guarino 1995). The term “infraspecific” is used here to refer to variation within a cultivated taxon, but it should be pointed out that the crop in a wild-weedy-crop complex is often given subspecific rank, following the proposal of Harlan and De Wet (1971). Morphological infraspecific variation has been studied in many crops, though often for only a limited part of their geographic range or for a restricted set of characters. Formerly there were regular literature reviews on the taxonomy of cultivated plants, but these tasks have been taken over by the Plant Genetic Resources Abstracts (see Dearing and Guarino 1995).Traditional Floras sometimes consider variation within crop plants, though never in much detail. However, there are also specialized Floras dealing only with cultivated plants (see below). A recent encyclopaedia on cultivated plants (excluding ornamentals and forest trees), which also discusses the taxonomic framework of crop taxonomy and evolution, is provided by Hanelt and IPK (2001). Because selfing results in the variation within a crop being split into distinct homozygous lines, autogamous species tend to be relatively easier to classify in detail into many groups than allogamous species. In the past, this has led to over-splitting, a trend that has been somewhat reversed by genetic studies. The different methods of approaching the infraspecific taxonomy of crops are discussed in this chapter insofar as they may be relevant to the needs of collectors. For further details, see Hanelt (1986) and Hanelt et al. (1993). Many classification proposals are written in languages other than English, but these somewhat overlooked approaches are also included in the focus of this paper. Two principle types of approaches are distinguished: formal taxonomic and informal classifications. Whereas in the former, formally recognized categories are used (more or less) according to the rules of the ICBN (McNeill et al. 2006), informal classifications use non-standard categories or categories as proposed in the International Code of Nomenclature of Cultivated Plants (ICNCP) (www.ishs.org/sci/icracpco.htm) (Brickell et al. 2009). In informal classifications, therefore, problems with nomenclature that result from the use of the ICBN are avoided, although there are other formal preconditions deriving from the ICNCP. Moreover, the two codes are not always compatible (Brandenburg and Schneider 1988; Ochsmann 2004) and a broadly accepted designation of a group is not guaranteed in informal classifications; therefore, communication of information on the material under study is more difficult. Usually these classifications are based on a few, easily recognizable morphological characteristics and allow a rapid overview of variation within a crop. Several major publication projects have been based on this type of infraspecific classification, e.g., the Flora of Cultivated Plants of the Soviet Union (Dorofeev and Korovina 1979) and the Cultivated Plants of Hungary (Máthé and Priszter 1982). R. Mansfeld, the founder of the Gatersleben school of taxonomy, which has studied the infraspecific classification of several important cereal, legume and vegetable crops, provides a typical example with his morphological system of Triticum aestivum (Mansfeld 1951). He considers 12 characteristics and organizes infraspecific variation into more than 400 varieties, each differing from related ones in only one character. Mansfeld’s (1950) scheme for Hordeum vulgare can serve as another example. Below the species level, he applied the category of “convariety” (as defined by Alefeld 1866; see also Helm 1964) and accepted five convarieties, defined by major spike characters: convar. vulgare (convar. hexastichon), convar. intermedium, convar. distichon, convar. deficiens and convar. labile. Formerly, some of these convarieties were even described as separate species (not least, by Linnaeus). There are some differences in geographic distribution and even some crossing barriers among them, which might indicate that this category has some biological significance. “Varieties”, of which 191 are described, are purely artificial entities, however. In fact, such classifications are, as a rule, rather artificial, especially at lower taxonomic levels. The same principles have been applied to Papaver somniferum. Based on the classification of Danert (1958), Hammer (1981) developed a system containing three subspecies: ssp. setigerum is the wild ancestor; ssp. somniferum and ssp. songaricum are both cultivated. The cultivated subspecies differ in having sulcate lobes of the stigmatic disc with dentate margins versus flat lobes with entire margins. These characters have been considered as important by some Papaver taxonomists and also show clear geographic differentiation. The convariety level is defined by indehiscent versus dehiscent capsules, another important character indicating different stages of domestication (Hanelt and Hammer 1987). The variety level is based on seed colour (resulting from selection pressures under domestication) and other characteristics. This system was recently rejected (Dittbrenner 2009; Dittbrenner et al. 2008), mainly using arguments from the culton-concept (Hetterscheid and Brandenburg 1995). After this, the Gatersleben genebank started to follow the Western approach in respect to infraspecific classifications. Diagnostic-morphological classifications have proven to be very useful for keeping and elaborating large collections of cultivated plants (e.g., in genebanks), as well as for to the plant collector. Since the morphological entities that define these classifications can be recognized relatively easily, they can be used as the basis of field checklists. Rapid comparison of different areas with regard to the variation found there is possible and gaps in collections can be identified. Assessments of variation at different times based on such classifications have been used to estimate genetic erosion, for example in Sicily (Perrino and Hammer 1983; Prestianni 1926) and other parts of Italy (Hammer and Laghetti 2005). The controversy between the proponents of diagnostic-morphological classification is yet to be resolved. It can best be demonstrated in wheat: Dorofeev and Korovina (1979) subdivide Triticum aestivum into two subspecies, three convarieties and 194 varieties. And whereas Mansfeld (1951) included T. compactum in T. aestivum, Dorofeev and Korovina classified it as a separate species with three convarieties and an additional 93 varieties. While many interesting conclusions can be drawn on the basis of this system, as recently demonstrated by Filatenko et al. (2010), geneticists and plant breeders like Mac Key (1988), however, resist any further detailed subdivision between the levels of subspecies and cultivar. They do not see the necessity to describe entities that are not genetically meaningful, are characterized by a few common monofactorially inherited character states, and do not indicate properties that are important for the plant breeder (Hanelt 1988). Breeders are inclined to use more open, less formalized classifications, into which their material can be incorporated without difficulty (i.e., in the sense of the ICNCP) (Brickell et al. 2009). The polemics against diagnostic classifications have a long-standing history. Hawkes (1980) observed an East-West division with regard to the preference of such detailed diagnostic classifications (see also Hanelt 1988). Large collections of cultivated plants have been created in the eastern parts of Europe, for which diagnostic classifications have proved to be useful. Some exceptions are Percival (1921) and Mansfeld (1951), but they had considerably large collections at their disposal. At any rate, Mac Key’s (1966) system does not have detailed infraspecific treatment. A tool for the mutual understanding and use of both systems is now available (Hammer et al. 2011). But for the international use of Dorofeev and Korovina’s (1979) Russian wheat monograph, an English translation is necessary; there is one in preparation (Knüpffer et al. 2004). In some cases, the classifications are of restricted applicability because they deal with the cultivated flora of a rather restricted area (e.g., Máthé and Priszter 1982). However, even country Floras of cultivated flora may employ a comprehensive concept of taxa, even allowing them to be used for a worldwide survey. The Flora of the Cultivated Plants of the Soviet Union is perhaps the best example. Some important contributions, in addition to the Triticum volume mentioned above, are Fursa and Filov (1982), Girenko and Korovina (1988), Kazakova (1978), Kobyljanskij (1989), Kobyljanskij and Lukjanova (1990), Kobyljanskij and Soldatov (1994), Makaševa (1979), Mukhina and Stankevič (1993), Pyženkov (1994), Šmaraev and Korovina (1982), Stankevič and Rep’ev (1999). In the last few years no new infraspecific classifications have appeared in this series. A recent monograph from the Vavilov Institute (Loskutov 2007), but not in the series cited above, has appeared without a detailed infraspecific treatment (which can be found in Kobyljanskij and Soldatov 1994). This could possibly be seen as a new trend. The old morphological classifications of the Gatersleben school are listed by Hammer (1981). In addition to the species already mentioned, there are treatments of Beta vulgaris, Brassica oleracea, Glycine max, Linum usitatissimum, Lycopersicon esculentum, Nicotiana rustica, N. tabacum, Pisum sativum and many other crops. More recent treatments include Raphanus (Pistrick 1987), Brassica oleracea (Gladis and Hammer 2003), Brassica spp. (Gladis and Hammer 1992), Coriandrum (Diederichsen and Hammer 2003) and Ocimum (Eckelmann 2003). For a recent compilation of diagnostic-morphological classifications, see Landsrath and Hammer (2007). Obviously, there has been a certain decline in the last few years. A potential problem with diagnostic-morphological classifications is still the difficulty in comprehension and their limited availability – many are not available in English and might be difficult to obtain. As a result, some older classifications, such as that of Percival (1921) on Triticum, are sometimes used even today. The forthcoming edition of Dorofeev and Korovina (1979) in English could improve the situation, at least with respect to Triticum. Most of the available diagnostic morphological classifications for Central European crop plants are, as already mentioned, included in a modern treatment of Alefeld’s “Agricultural Flora” (Landsrath and Hammer 2007). Alefeld and Körnicke (Hammer 2005) can be considered as the founders of intensive work with those classifications. These classifications consider a large number of characters. Various multivariate mathematical methods are used to calculate similarities among infraspecific taxa and to identify groupings. There are several examples (reviewed by Schultze-Motel 1987; see also Baum et al. 1984) but none is particularly convincing in the context of formal taxonomy. They cannot be recommended for the practical use of the plant collector. Such classifications have been developed by the Vavilov Institute, based on the hypothesis that, in an area where selection pressure from environmental factors, cultivation practices, propagation methods, etc., is relatively homogeneous, a crop will tend to have a certain genetic integrity (Vavilov 1940). An example of ecogeographic classification is that proposed by Flaksberger (1935) for Triticum aestivum, which includes two subspecies, 15 proles and six subproles. New taxonomic categories have often been introduced. Groups are largely defined by their geographic origin and by characteristics that reflect the agricultural and ecological conditions to which they are adapted (e.g., reproductive phenology, pest and disease resistance, growth characteristics, etc.). In general, field experiments are necessary to verify the categories and to incorporate new accessions into such a classification. Therefore, a collector might not be able to apply them directly during fieldwork. However, they might be very useful for the characterization of collections, facilitating the use of the material by breeders. There is still no bridge between formal ecogeographical classifications and the use of an ecogeographic approach in fieldwork (Maxted et al. 1995). There are some regional studies of this type. The classification of French bush bean cultivars is one. They have been arranged into three categories: groups, sections and classes (Anon. 1983). Pod characteristics (11 character states) are used to differentiate groups and sections; and leaf colour, pod length, colour of unripe pods and length of bracts (12 character states) for differentiating classes. The resulting system comprises five groups, 14 sections and many classes. Another example, also from Phaseolus vulgaris, shows that the input of biochemical methods (in this case, phaseoline types) can lead to phytogenetically more relevant groupings within an informal diagnostic-morphological classification (Krell and Hammer 2008, Singh et al. 1991). The extremely reduced possibilities for infraspecific classifications of cultivated plants under the ICNCP (Brickell et al. 2009), largely following the proposal of the culton concept (Hetterscheid and Brandenburg 1995), which is still heavily disputed (Hanelt 2001, Pickersgill and Karamura 1999), have to be considered here. Many new approaches are of this type, e.g., in Cruciferae, Cucurbitaceae and also Gramineae. They are formally dependent on the ICNCP and thus they lack the flexibility of informal classifications. This is one of the disadvantages of this code, which became user driven (by the flower and seed industry) under the forceful argumentation of the cultonomists. One of the best examples of this type of classification is the study of the South American cultivars of cassava (Manihot esculenta) by Rogers and Fleming (1973). They used 55 character states and defined 19 groups of cultivars. Within these groups, there is a high degree of phenotypic similarity, and evidently also considerable genetic similarity. New material can be easily incorporated into the proposed classification scheme; however, the evaluation of the basic data for this type of study is very time consuming. The range of potentially relevant morphological characteristics for a species, which can be measured in morphological analysis, is summarized in descriptor lists. Some of the crop descriptors and monographs have been published and are available online on the Bioversity International website (www.bioversityinternational.org/publications.html). This type of classification is only possible in crops with well-studied genetics, such as Pisum sativum (Blixt 1979), where the genes responsible for the expression of many different characteristics are known. In peas, there has also been an attempt to combine a formal diagnostic and a genetic classification (Lehmann and Blixt 1984). It is difficult to incorporate new material into such classifications. Test crosses are necessary and multifactoral characteristics cannot be included at all. Classifications based on genomic composition are somewhat different. An example is that of Simmonds for the edible fruit-bearing bananas (Simmonds 1966; Simmonds and Weatherup 1990). These are classified by references to ploidy (2×, 3×, 4×) and the genomic contribution made by two diploid wild species (AA Musa acuminata and BB Musa balbisiana). Some 15 characteristics are used to distinguish among cultivar groups. Infraspecific items are not involved in this example. Problems with species designations (and also with infraspecific ones) arise when dealing with hybrid genera, as, e.g., × Triticosecale, according to the ICBN (Hammer et al. 2011). In the last decade, increased attention has been devoted to molecular marker technologies, including DNA sequences. These have provided a wealth of data, which, together with phenotypic and ecological data, have significantly increased our understanding of the intra-specific dynamics of these genetic resources. The study findings provide not only information for classification but also a geographic framework of references to elucidate patterns of genetic diversity and domestication, constituting a source of diversity for a wide range of traits (Gepts et al. 1999). Combined with phenotypic data and multivariate statistical analysis, the recent progress in molecular mapping also provides opportunities to identify and transfer genes (geneflow) for quantitative traits and processes of domestication (Tanksely and McCouch 1997). Molecular marker technologies are useful tools for measuring lineages and comparative relationships between individuals, populations and species, obtaining evidence of recent bottlenecks in populations in size, as well as documenting geneflow, recombination and seed supply and identifying varieties (Brown et al. 1996). In the genus Vigna, family of Fabaceae, for instance, Tomooka et al. (2002) described the subgenus of Vigna ceratotropis and suggested revising the nomenclature of the group, based on past taxonomic treatments and their biosystematics results, including diversity distributions, species relationships and cross-compatibility studies. Saravanakumar et al. (2004) conducted a random amplified polymorphic DNA (RAPD) analysis to enhance understanding of the diversity of Vigna species from Palney Hills in India, to determine (1) the taxonomic relationship between V. trinervia var. trinervia and V. trinervia var. bourneae, (2) the distinction between V. trinervia collected at a high altitude of about 1000m and at a low altitude, (3) the relationship among V. radiate var. sublobata from different geographic locations and (4) relationships between V. dalzelliana and other species. In the genus Oryza, the taxonomy of the three diploid CC genome of Oryza species (O. eichingeri, O. officinalis and O. rhizomatis) has been confused and several different names have been used in the literature and herbaria (e.g., Dally and Second 1990; Duistermaat 1987; Harriman 1994; Katayama and Ogawa 1974; Sharma and Shastry 1965; Tateoka and Pancho 1963). This was because two major useful characteristics (chromosome number and rhizome formation) are not readily visible for some species in the complex. Later molecular-based diversity studies helped to find the relationships within the diploid CC genome species complex, thus showing their evolutionally history (e.g., AFLP: Aggarwal et al. 1999; isozymes: Second 1984; RFLP: Wang et al. 1992; ISSR: Joshi et al. 2000; chloroplast SSR: Ishii and McCouch 2000; 5SDNA sequences: McIntyre et al. 1992; RAPDs Xie et al. 1998). In the common bean, genus Phaseolus, Debouck (1999) has indicated generic limitations in the taxonomic classification. He comments that over 400 species of Phaseolus have been named over the past two centuries, often with poor description or lacking good type specimens. He also indicates that “we do not know yet exactly how many Phaseolus species are existing, 50–60 species would be a reasonable estimate” on the basis of species cross-compatibility, several molecular marker studies (Fofana et al. 1997, 1999; Jaaska 1996; Jacob et al. 1995) and extensive herbarium field exploration surveys, including his own (Debouck 1991, 1999). Gepts et al. (1999) look at the genetic diversity and domestication of the common bean (Phaseolus vulgaris). For the faba bean (Vicia faba L.), RAPD and restriction fragment length polymorphism (RFLP) techniques were employed to analyse the same faba bean populations described by Muratova (1931), to find possible relationships within the V. faba genepool from different geographic regions and to try to elucidate the routes of dispersal of the faba bean as a crop (Potokina et al. 1999). Most recently, molecular classification techniques have grown in importance to crop improvement. Arai-Kichise et al. (2011) used single nucleotide polymorphisms (SNPs) and insertions-deletions (InDels) between highly homologous genomes, and performed whole-genome sequencing of a landrace of japonica rice. They identified 132,462 SNPs between the genomes of Omachi and Nipponbare, which are closely related cultivars. They also validated InDels on a part of chromosome 2 as DNA markers and successfully genotyped five japonica rice cultivars. This provides a methodology and extensive data on SNPs and InDels available for whole-genome genotyping and marker-assisted breeding. However, these techniques have been applied so far mostly to “model species” such as humans, yeasts and some of the major crops such as rice, maize and wheat, as well as beans. The technology is still expensive, and a positive return on investment in this technology has not yet been recognized. Nevertheless, classifications based on genetic data (including molecular markers) are probably the best guides for germplasm collectors when collecting plant genetic resources – better than mostly morphological/botanical traits. Since the genetics of a species need to be well understood for this, the value of such genetic analyses is greater for collectors when gap-filling collections are made. There is no single classification approach suitable for all possible demands; different aims can be achieved with different types of classifications. Hanelt (1972) proposed a combination of classifications for Vicia faba: a formal diagnostic classification into two subspecies, three varieties and six subvarieties (based mainly on seed size, form and structure of pods) was combined with an informal classification into 14 races, based mainly on ecogeographic data. A similar approach has been used for Citrullus lanatus (Fursa 1981). In a number of cases, Jeffrey (e.g., in the “Compositae” [Jeffrey 2001]) preferred the informal classification according to the ICNCP (open classification, according to Brandenburg 1999). For Cynara cardunculus, Jeffrey considers a cardoon group and a globe artichoke group, with broad synonymy from the formal classifications (closed classification, according to Brandenburg 1999). This can be considered as an extreme case of a mixed classification. Hammer (2001), in treating the Chenopodiaceae, classified Beta according to a formal system and provided the informal groups after the synonymy, e.g., sugar beet: Beta vulgaris var. altissima (the sugar beet group). At any rate, with the new development of the ICNCP, more synonymy-like indications will be necessary for exact agrobotanical work, especially in the group of cultivated plants within Mansfeld’s definition (Hanelt and IPK 2001). Landraces are named according to specific morphological characteristics of the fruit, or sometimes after the village where they were obtained. 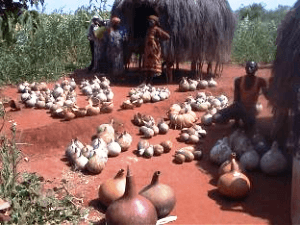 This homestead is at “Mutha” village in Kitui District, Kenya, where local people classified 242 gourds into 33 landraces. Diversity in uses – associated with diverse fruit traits – is the most important driving force for strong selection. Farmers carefully choose several different types from their previous harvest depending on their needs. Varieties used for oil (right) have distinctly larger seeds than varieties used for containers and food (left row). Farmers’ classification is considered to be the most uncertain classification system; however, it is the most useful guide in narrowing the range of agro-morphological criteria, which are usually linked to the genetic diversity of a crop. They are used by farmers to distinguish and name crop varieties and are commonly the basis for farmers’ selection of varieties, which is important in shaping the population over time (Jarvis et al. 2000). It is therefore of direct relevance to farmers and plant breeders in their use of germplasm. Berlin (1999) states that while folk or ethnobotanical classifications are not comprehensive, he gives an example of the naming behaviour of the Tzeltal Maya community in Chiapas, Mexico, which is to conceptually relate an unknown plant to a prototype that has been encountered before. Berlin refers to this as “exemplar comparison” (from Medin 1989) and describes it as the basis of the “perceptual affinities” of the new target species to the original prototype. Many studies have pointed out how farmers recognize and name the crops they grow according to agromorphological, ecological-adaptive, quality and use characteristics (Bellon and Brush 1994; Boster 1985; Quiros et al. 1990; Schneider 1999; Soleri and Cleveland 2001; Teshome et al. 1997). The names of farmers’ varieties, for instance, are often related to the original source of the material, the morphology of the plant, agronomic performance, adaptation to particular environmental factors, and the use of the material, including its role in religious ceremonies. When collecting information from farmers, it is important to note down the exact name of each variety as given by the farmer, without modifying it, using the local alphabet if possible (Jarvis et al. 2000). However, farmers might not be consistent in naming and describing landraces. Studies have indicated that sometimes there is consistency between variety names and genetic distinctiveness (Karamura 2004; Mar and Holly 2000), but other times there is not. For example, a study in Ethiopia has shown different names for the same variety, reflecting an emphasis on different qualities by different farmers or communities. Another example is durum wheat in Ethiopia. In some villages, a variety is called “white”, whereas in the others, the same variety is called “early” (Tanto 2001). Tesfaye and Ludders (2003) found similar evidence in Ethiopia for enset, a clonally propagated crop, for which a few landraces assumed different names at different locations. Sawadogo et al. (2005) indicate that differences in variety names in the same village or community reflect differences in the languages used to name the variety. Farmers’ names also vary with the gender, age or ethnic group of the individual (Canh et al. 2003; Hue et al. 2003; Karamura et al. 2004; Mulumbo et al. 2004). Fujimoto (1997) mentions that farmers also categorize enset landraces based on their reminiscences, such as which offspring are derived from which mother plant, a classification he describes as “genealogical classification”. Sigeta (1995) indicates that farmers’ names are described differently depending on individual recognition. In order to enhance better understanding of this classification, he emphasizes that researchers need to focus more on farmers’ actions and recognition rather than the morphological characteristics and performance of the plants. In addition to consistency in variety names, it is important to find different degrees of adaptive and quality traits and to develop a level of consensus between farmers on their selection criteria for planting seeds. The structure of genetic variability between and within farmer-named varieties has also been described using biochemical and molecular markers. Teshome et al. (1999) assessed farmers’ knowledge of the resistance of sorghum landraces to the rice weevil in storage and revealed that, according to biochemical and molecular markers, the level of landrace susceptibility to the weevil was highly correlated with farmers’ classifications. These research approaches require intensive investigation with farmers, visits to the field and participatory measurement during all stages of crop development. Clarification of what constitutes a landrace at each level (individual, family, community, village and region) is the first step toward defining the amount and distribution of crop diversity maintained by farmers. It is well known that most of the more important and widespread crop species are characterized by an enormous amount of infraspecific variation. Familiarity with this is essential for the effective collecting of plant genetic resources. There are many publications on the infraspecific taxonomy of crop plants, but many have been written in languages other than English (particularly the most important papers of the Vavilov school). A variety of methods have been proposed for the classification of crop plants. Those most appropriate for collectors seem to be the ones based on easily recognizable characteristics of gross morphology. Variation in such characteristics can be used to establish taxonomically formal or informal diagnostic classifications, which will be no less useful for the later management of collections than for the collector in the field. As discussed here, there has been a reduction in the use of infraspecific classifications, which is connected with a reduction in knowledge about the functions and usefulness of such classifications. Infraspecific classifications are of limited use for plant breeding, but they are of great use to the plant collector and to genebank management. Together with a six-fold paradigm shift in the area of plant genetic resources (Hammer 2003), we are losing the methods and means that are helpful for their collection, maintenance and characterization. The abandonment of infraspecific classifications, which has been strongly advocated for many crops, leads to a loss of information (quantity and quality). The momentum that has been lost depends on the crop, the kind of research being done and the research community. In barley, for example, infraspecific classification has been largely abandoned, whereas in wheat, many publications still use infraspecific classifications, especially when reporting about landraces. Moreover, recent developments in the Cultivated Plant Code (Brickell et al. 2009) and its application have exclusively concerned plants grown in developed countries, “with well-organised trades in harvested products, planting material or both, and often with International Registration Authorities to regulate the application of cultivar names” (Pickersgill and Karamura 1999). Landraces with their characteristic and rich morphological structure are today neglected in this respect by the Code. Aggarwal AK, Brar DS, Nandi S, Huang N, Khush GS. 1999. Phylogenetic relationships among Oryza species revealed by AFLP markers. Theoretical and Applied Genetics 98:1320–1328. Alefeld F. 1866. Landwirthschaftliche Flora. Wiegandt & Hempel, Berlin. Anon. 1983. Description et essai de classification de variétés de Haricot Nain. National Institute for Agricultural Research (INRA), Versailles. Andrews S, Leslie AC, Alexander C, editors. 1999. Taxonomy of Cultivated Plants: Third International Symposium. Royal Botanic Gardens, Kew, UK. Arai-Kichise Y, Shiwa Y, Nagasaki H, Ebana K, Yoshikawa H, Yano M, Wakasa K. 2011. Discovery of genome-wide DNA polymorphisms in a landrace cultivar of japonica rice by whole-genome sequencing. Plant Cell Physiology 52(2):274–282. Baum BR. 1981 Taxonomy of the infraspecific variability of cultivated plants. Kulturpflanze 29:209–239. Baum BR, Duncan T, Phillips RB. 1984. A bibliography of numerical phenetic studies in systematic botany. Annals of the Missouri Botanical Garden 71:1044–1060. Bellon MR, Brush SB. 1994. Keepers of the maize in Chiapas, Mexico. Economic Botany 48:196û209. Berlin B. 1999. Chapter 4: How a folk botanical system can be both natural and comprehensive: one Maya Indian’s view of the plant world. In: Medin DL, Atran S, editors. Folkbiology. Massachusetts Institute of Technology. pp.71–89. Blixt S. 1979. Some genes of importance for the evolution of the pea in cultivation (and a short presentation of the Weibullsholm-PGA collection). In: Zeven AC, van Harten AM, editors. Broadening the Genetic Basis of Crops. PUDOC, Wageningen, The Netherlands. pp.195–202. Boster JS. 1985. Selection for perceptual distinctiveness: evidence from Aguaruna cultivars of Manihot esculenta. Economic botany 39(3):310–325. Brandenburg WA. 1999. Crop-weed complexes and the culton concept. In: Andrews S, Leslie AC, Alexander C, editors. Taxonomy of Cultivated Plants: Third International Symposium. Royal Botanic Gardens, Kew, UK. pp.145–157. Brandenburg WA, Schneider F. 1988. Cultivar grouping in relation to the International Code of Nomenclature for Cultivated Plants. Taxon 37:141–147. Brickell CD, Alexander C, David JC, Hetterscheid WLA, Leslie AC, Malecot V, Xiaobai Jin, Cubey JJ, editors. 2009. New Edition of the International Code of Nomenclature for Cultivated Plants. Scripta Horticulturae 10. International Society for Horticultural Science, Leuven, Belgium. Brown SM, Hopkins MS, Mitchell SE, Wang TY, Kresovich S, Duncan RR, Senior ML and Gonzalez-Candelas F. 1996. Multiple methods for the identification of polymorphic simple sequence repeats (SSRs) in sorghum (Sorghum bicolor L. Moench). Theoretical and Applied Genetics 93:190–198. Canh NT, On TV, Trung NV, Tiep CA, Lam HV. 2003. Preliminary study of genetic diversity in rice landraces in Ban Khoang Commune, Sa Pa District. In: Tuan HD, Hue NN, Sthapit BR, Jarvis DI, editors. On-Farm Management of Agricultural Biodiversity in Vietnam: Proceedings of a Symposium, 6–12 December 2001, Hanoi, Vietnam. International Plant Genetic Resources Institute, Rome. Available online (accessed 20 October 2011): www.bioversityinternational.org/index.php?id=19&user_bioversitypublications_pi1%5BshowUid%5D=2750. Dally AM, Second G. 1990. Chloroplast DNA diversity in wild and cultivated species of rice (genus Oryza, section Oryza). Cladistic-mutation and genetic distance analysis. Theoretical and Applied Genetics 80:209–222. Danert S. 1958 Zur Systematik von Papaver somniferum L. Kulturpflanze 6:61–88. de Wet JMJ. 1978 Systematics and evolution of Sorghum sect. Sorghum (Gramineae). Amer. J. Bot. 65: 477 – 488. Dearing JA, Guarino L. 1995 Bibliographic databases for plant germplasm collectors. In: Guarino L, Ramanatha Rao V, Reid R editors. Collecting Plant Genetic Diversity: Technical Guidelines. CAB International, Wallingford, UK. pp.229–254. Available online (accessed 20 October 2011): http://cropgenebank.sgrp.cgiar.org/images/file/procedures/collecting1995/Chapter13.pdf. Debouck, DG. 1991. Systematics and morphology. In: Van Schoonhoven A, Voysest O, editors. Common Beans: Research for Crop Improvement. CAB International, Wallingford, UK. pp.55–118. Debouck, DG. 1999. Diversity in Phaseolus species in relation to the common bean. In: Singh SP, editor. Common Bean Improvement in the Twenty-First Century. Kluwer Academic Publishers, Dordrecht, The Netherlands. pp.25–52. Diederichsen A. 2004. Case studies for the use of infraspecific classification in managing germplasm collections in cultivated plants. Acta Horticulturae 634:127–139. Diederichsen A, Hammer K. 2003. The infraspecific taxa of coriander (Coriandrum sativum L.). Genetic Resources and Crop Evolution 50:33–63. Dittbrenner A. 2009. Morphologische, phytochemische und molekulare Untersuchungen zur infraspezifischen Diversität von Schafmohn (Papaver somniferum L.). Dissertation. Martin Luther University of Halle-Wittenberg, Germany. Dittbrenner A, Lohwasser U, Mock H-P, Börner A. 2008. Molecular and phytochemical studies of Papaver somniferum in the context of infraspecific classification. Acta Horticulturae 799:81–88. Dorofeev VF, Korovina ON, editors. 1979. Pšenica (Wheat). Kul’turnaja Flora. Vol. 1. Kolos, Leningrad. Duistermaat H. 1987. A revision of Oryza (Gramineae) in Malesia and Australia. Blumea 32:157–193. Eckelmann S. 2003. Biodiversität der Gattung Ocimum L., insbesondere der Kultursippen. Schriften zu Genetischen Ressourcen 19. Kassel, Bonn. Filatenko AA, Hammer K, Al Khanjari S, Buerkert A. 2010. Six new botanical varieties of Triticum from Oman. Genetic Resources and Crop Evolution 57:1135–1139. Flaksberger CA. 1935. Cereals: Wheat. In: Vulf EV, editor. Flora of Cultivated Plants. Vol. 1. State Agricultural Publishing Co., Moscow and Leningrad. Fofana, B, Vekemans X, du Jardin P, Baudoin JP. 1997. Genetic diversity in Lima bean (Phaseolus lunatus L.) as revealed by RAPD markers. Euphytica 95:157–165. Fofana B, Baudoin JP, Vekemans X, Debouck DG, du Jardin P. 1999. Molecular evidence for an Andean origin and a secondary gene pool for the Lima bean (Phaseolus lunatus L.) using chloroplast DNA. Theoretical and Applied Genetics 98:202–212. Fujimoto T. 1997. 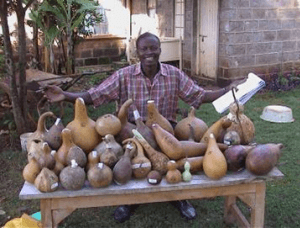 Enset and its varieties among the Malo, south western Ethiopia. In: Fukui K, Kurimoto E, Shigeta M, editors. Ethiopia in Broader Perspective. Vol. III. Papers of the 13th International Conference of Ethiopian Studies, 12–17 December 1997, Kyoto. pp.867–882. Fursa TB. 1981. Intraspecific classification of water-melon under cultivation. Kulturpflanze 29:297–300. Fursa TB, Filov AI. 1982. Tykvennye [Cucurbitaceae – Citrullus, Cucurbita]. In: Brežnev DD, editor. Kul’turnaja Flora SSSR. Vol. 21. Kolos, Moscow. Gepts P, Papa R, Coulibaly S, Gonzalez Mejia A, Pasquet R. 1999. Wild legume diversity and domestication – insights from molecular methods. In: The 7th MAFF International Workshop on Genetic Resources: Part 1. Wild Legumes. National Institute of Agrobiological Resources, Tukuba, Ibaraki, Japan. pp.19–31. Available online (accessed 20 October 2011): www.gene.affrc.go.jp/pdf/misc/international-WS_07.pdf. Girenko MM, Korovina ON. 1988. Listovye ovoščnye rastenija [Leafy vegetables – asparagus, rhubarb, sorrel, spinach, purslane, garden cress, dill, chicory, lettuce]. In: Dorofeev VF, editor. Kul’turnaja Flora SSSR. Vol. 12. Agropromizdat, Leningrad. Gladis Th, Hammer K. 1992. Die Gaterslebener Brassica-Kollektion – Brassica juncea, B. napus, B. nigra und B. rapa. Feddes Repertorium 103:469–507. Gladis Th, Hammer K. 2003. Die Brassica-oleracea-Gruppe. Schriften VEN, Lennestadt, Germany. Hammer K. 1981. Problems of Papaver somniferum classification and some remarks on recently collected European poppy land-races. Kultupflanze 29:287–296. Hammer K. 2001. Chenopodiaceae. In: Hanelt P and IPK, editors. Mansfeld’s Encyclopedia of Agricultural and Horticultural Crops. Vol. 1. Springer, Berlin. pp.235–284. Hammer K. 2003. A paradigm shift in the discipline of plant genetic resources. Genetic Resources and Crop Evolution 50:3–10. Hammer K. 2005. Der Poppelsdorfer Forscher Friedrich August Körnicke (1828–1908). Vortr. Pflanzenzüchtg 67:7–11. Hammer K, Laghetti G. 2005. Genetic erosion – examples from Italy. Genetic Resources and Crop Evolution 52:629–634. Hammer K, Filatenko AA, Pistrick K. 2011. Taxonomic remarks on Triticum L. and ×Triticosecale Wittm. Genetic Resources and Crop Evolution 58(1):3–10. Hanelt P. 1972. Die infraspezifische Variabilität von Vicia faba L.und ihre Gliederung. Kulturpflanze 20:75–128. Hanelt P. 1986. Formal and informal classifications of the infraspecific variability of cultivated plants – advantages and limitations. In: Styles BT, editor. Infraspecific Classification of Wild and Cultivated Plants. Clarendon Press, Oxford, UK. pp.139–156. Hanelt P. 1988. Taxonomy as a tool for studying plant genetic resources. Kulturpflanze 36:169–187. Hanelt P. 2001. Preface. In: Hanelt P and IPK, editors. Mansfeld’s Encyclopedia of Agricultural and Horticultural Crops (Except Ornamentals). Vol. 1. Springer, Berlin. pp.xxv–xxvii. Hanelt P, Hammer K. 1987. Einige infragenerische Umkombinationen und Neubeschreibungen bei Brassica L. und Papaver L. Feddes Repertorium 98:553–555. Hanelt P and IPK, editors. 2001. Mansfeld’s Encyclopedia of Agricultural and Horticultural Crops. Springer, Berlin. Hanelt P, Linne von Berg G, Klaas M. 1993. Taxonomische Untersuchungen zur infraspezifischen Variabilität bei Kulturpflanzen. Vortr. Planzenzüchtg 25:212–227. Harlan R, de Wet JMJ. 1971. Towards a rational taxonomy of cultivated plants. Taxon 20:509–517. Harriman NA. 1994. Poaceae. In: Dassanayake, MD, FR Fosberg, editors. A Revised Handbook to the Flora of Ceylon. Vol. 8. Amerind, New Dehli. Pp.326–330. Hawkes JG. 1980. Biosystematic studies of cultivated plants as an aid to breeding research and plant breeding. Kulturpflanze 29:327–335. Helm J. 1964. 100 Jahre Kulturpflanzentaxonomie. Dr. Friedrich Alefeld zum Gedächtnis. Kulturpflanze 12:75–92. Hetterscheid WLA, Brandenburg WA. 1995. Culton versus taxon: conceptual issues in cultivated plants taxonomy. Taxon 44:161–175. Hetterscheid WLA, van den Berg RG, Brandenburg WA. 1996. An annotated history of the principles of cultivated plant classification. Acta Botanica Neerlandica 45:123–134. Hue N, Trinh L, Ha N, Sthapit B, Jarvis D. 2003. Taro cultivar diversity in three ecosites of North Vietnam. In: Tuan HD, Hue NN, Sthapit BR, Jarvis DI, editors. On-Farm Management of Agricultural Biodiversity in Vietnam. Proceedings of a symposium, 6–12 December 2001, Hanoi, Vietnam. International Plant Genetic Resources Institute, Rome. Available online (accessed 20 October 2011): www.bioversityinternational.org/fileadmin/bioversity/publications/pdfs/863.pdf. Ishii T, McCouch SR. 2000. Microsatellites and microsynteny in the chloroplast genomes of Oryza and eight other Graminae species. Theoretical and Applied Genetics 100:1257–1266. Jaaska, V. 1996. Isoenzyme diversity and phylogenetic affinities among the Phaseolus beans (Fabaceae). Plant Systematics and Evolution 200:233–252. Jacob M, Zink D, Nagl W. 1995. RFLPs of the rRNA genes in the genus Phaseolus. Genetic Resources and Crop Evolution 42:97–106. Jarvis DI, Myer H, Klemick L, Guarino L, Smale M, Brown AHD, Sadiki M, Sthapit B, Hodgkin T. 2000. Chapter 4. Agromorphological characters, farmer selection and maintenance. In: Jarvis DI, Myer H, Klemick L, Guarino L, Smale M, Brown AHD, Sadiki M, Sthapit B, Hodgkin T. A Training Guide for In Situ Conservation On-Farm. Version 1. International Plant Genetic Resources Institute, Rome. pp.49–70. Available online (accessed 20 October 2011): www.bioversityinternational.org/fileadmin/bioversity/publications/pdfs/611.pdf?. Jeffrey C. 2001. Compositae (Asteraceae). In: Hanelt P. and IPK, editors. Mansfeld’s Encyclopedia of Agricultural and Horticultural Crops. Vol. 4. Springer, Berlin. pp.2035–2145. Joshi SP, Gupta VS, Aggarwal RK, Ranjekar PK, Brar DS. 2000. Genetic diversity and phylogenetic relationship as revealed by inter simple sequence repeat (ISSR) polymorphism in the genus Oryza. Theoretical and Applied Genetics 100:1311–1320. Karamura D. 2004. Estimation of distinct clones in the Uganda national banana germplasm collection. Presentation at a Workshop on Data Variables and Structure to Answer Questions That Support the Conservation and Use of Crop Genetic Diversity On-Farm, 20–24 September 2004, Rome. Karamura D, Karamura E, Wasswa J, Kayiwa B, Kalanzi A, Nkwiine C. 2004. Analysis of community banana based management practices: A farmer’s perspective towards maintaining diversity. Presentation at a Workshop on Data Variables and Structure to Answer Questions That Support the Conservation and Use of Crop Genetic Diversity On-Farm, 20–24 September 2004, Rome. Katayama T, Ogawa T. 1974. Cytological studies on the genus Oryza. VII. Cytogenetical studies on F1 hybrids between diploid O. punctata and diploid species having C genome. Japanese Journal. Breed 24:165–168. Kazakova AA. 1978. Luk [Allium]. In: Brežnev DD, editor. Kul’turnaja Flora SSSR. Vol. 10. Kolos, Leningrad. Knüpffer H, Ochsmann A. editors. 2003. Rudolf Mansfeld and Plant Genetic Resources. Schriften zu Genetischen Ressourcen 22. Kassel, Bonn. Knüpffer H, Morrison LA, Filatenko AA, Hammer K, Morgounov A, Faberová I. 2004. English translation of the 1979 Russian taxonomic monograph of Triticum L. by Dorofeev et al. : Project progress report. Schriften zu Genetischen Ressourcen 22:282–283. Kobljanskij VD, editor. 1989. Rož [Rye]. In: Dorofeev VF, editor. Kul’turnaja Flora SSSR. Vol. 2, part 2. Agropromizdat, Leningrad. Kobyljanskij VD, Lukjanova MV, editors. 1990. Jačmen [Barley]. In: Krivčenko VI, editor. Kul’turnaja Flora SSSR. Vol. 2, part 1. Agropromizdat, Leningrad. Kobyljanskij VD, Soldatov VN, editors. 1994. Oves [Oat]. In Kul’turnaja Flora. Vol. 2, part 3. Kolos, Moscow. Krell K, Hammer K. 2008. Five hundred years of garden bean (Phaseolus vulgaris L.) in Europe. Botany, history of introduction and genetic resources. Schriften VEN 7. Cremlingen – Schandelah. Landsrath S, Hammer K. 2007. Pflanzliche Agrarbiodiversität – eine essayistische Überarbeitung Friedrich Alefelds “Landwirtschaftlicher Flora” von 1866. Schriften des VEN. Cremlingen-Schandelah, Germany. Lehmann ChO, Blixt S. 1984. Artifical infraspecific classification in relation to phenotypic manifestation of certain genes in Pisum. Agri Hortique Genetica 42:49–74. Loskutov IG. 2007. Oves (Avena L.). Rasprostranenie, sistematika, evoljucija I selekcionnaja cennost. N.I. Vavilov All-Russian Research Institute of Plant Industry, Saint Petersburg. Mac Key J. 1966. Species relationships in Triticum. Hereditas Suppl. 2:237–276. Mac Key J. 1988. Plant breeding aspects on taxonomy of cultivated plants. Biologisches Zentralblatt 107:369–379. Makaševa RCh, editor. 1979. Zernovye bobovye kul’tury [grain legumes]. In: Brežnev DD, editor. Kul’turnaja Flora SSSR, vol. 4, part 1. Kolos, Leningrad. Mansfeld R. 1950. Das morphologische System der Saatgerse, Hordeum vulgare L. s.l. Züchter 20:8–24. Mansfeld R. 1951. Das morphologische System des Saatweizens, Triticum aestivum L. s.l. Züchter 21:41–60. Mansfeld R. 1953. Zur allgemeinen Systematik der Kulturpflanzen I. Kulturpflanze 1:138–155. Máthé I, Priszter S. 1982. The Cultivated Plants of Hungary. Akadémiai Kiadó, Budapest. Maxted N, van Slageren MW, Rihan JR. 1995. Ecogeographic surveys. In: Guarino L, Ramanatha Rao V, Reid R editors. Collecting Plant Genetic Diversity: Technical Guidelines. CAB International, Wallingford, UK. pp.255–285. Available online (accessed 20 October 2011): http://cropgenebank.sgrp.cgiar.org/images/file/procedures/collecting1995/Chapter14.pdf. McIntyre B, Winberg K, Houchins RA, Baum BR. 1992. Relationships between Oryza species (Poaceae) based on 5S DNA sequences. Plant Systematics and Evolution 183:249–264. McNeill J, Barrie FR, Burdet HM, Demoulin V, Hawksworth DL, Marhold K, Nicolson DH, Prado J, Silva PC, Skog JE, Wiersema JH, Turland NJ. 2006. International Code of Botanical Nomenclature (Vienna Code). Regnum Vegetabile 146. A.R.G. Gantner Verlag, Rugell, Lichtenstein. Available online (accessed 20 October 2011): http://ibot.sav.sk/icbn/main.htm. Medin D. 1989. Concepts and conceptual structure. American Psychologist 12:1469–1481. Moss H, Guarino L. 1995. Gathering and recording data in the field. In: Guarino L, Ramanatha Rao V, Reid R, editors. Collecting Plant Genetic Diversity: Technical Guidelines. CAB International, Wallingford, UK. pp.367–417. Available online (accessed 20 October 2011): http://cropgenebank.sgrp.cgiar.org/images/file/procedures/collecting1995/Chapter19.pdf. Mukhina NA, Stankevič AK, editors. 1993. Mnogoletnie bobovye travy [Clover, birdsfoot trefoil]. Kul’turnaja Flora. Vol. 13. Kolos, Moscow. Mulumbo JW, Nkwiine C, Male-Koyiwa B, Kalanzi A, Karamura D. 2004. Evaluation of farmers’ best practices for on-farm conservation of rare banana cultivars in the semi-arid region of Lwengo sub-county, Uganda. Uganda Journal of Agricultural Sciences 9:281–288. Muratova, V. 1931. Common beans (Vicia faba L.). Bulletin of Applied Botany of Genetics and Plant Breeding. 50th supplement. pp.248–285. Nechanský F, Jirásek V. 1967. Systematische Studie über kultivierte Sommerastern (Gartenastern) – Callistephus chinensis (L.) Nees (Asteraceae). Preslia 39:122–150. Ochsmann J. 2004. Current problems in nomenclature and taxonomy of cultivated plants. XXVI International Horticultural Congress: IV International Symposium on Taxonomy of Cultivated Plants. Acta Horticulturae 634:53–61. Available online (accessed 20 October 2011): www.actahort.org/books/634/634_5.htm. Perrino P, Hammer K. 1983. Sicilian wheat varieties. Kulturpflanze 31:229–279. Percival J. 1921. The Wheat Plant. Duckworth and Co., London. Available online (accessed 24 October 2011): www.archive.org/details/wheatplantperciv00percrich. Pickersgill B, Karamura DA. 1999. Issues and options in the classification of cultivated bananas, with particular reference to the East African highland bananas. In: Andrews S, Leslie AC, Alexander C, editors. Taxonomy of Cultivated Plants: Third International Symposium. Royal Botanic Gardens, Kew, UK. pp.159–167. Pistrick K. 1987. Untersuchungen zur Systematik der Gattung Raphanus L. Kulturpflanze 35:225–321. Potokina E, Tomooka N, Vaughan DA, Alexandrova T, Xu RQ. 1999. Phylogeny of Vicia subgenus Vicia (Fabaceae) based on analysis of RAPDs and RFLP of PCR-amplified chloroplast genes. Genetic Resources and Crop Evolution 46:149–161. Prestianni P. 1926. I frumenti coltivati in Sicilia. Commissione Provinciale per la Propaganda Granaria di Caltanissetta, Caltanissetta, Italy. Pyženkov VI, editor. 1994. Tykvennye (Cucurbitaceae). Kul’turnaja Flora. Vol. 21. Kolos, Moscow. Quiros CF, Brush SB, Douches DS, Zimmerer KS, Huestis G. 1990. Biochemical and fork assessment of variability of Andean cultivated potatoes. Economic Botany 44(2):254–266. Rogers DJ, Fleming HS. 1973. A monograph of Manihot esculenta with an explanation of the taximetric methods used. Economic Botany 27:1–113. Saravanakumar P, Kaga A, Tomooka N, Vaughan DA. 2004. AFLP and RAPD analyses of intra- and interspecific variation in some Vigna subgenus Ceratotropis (Leguminosae) species. Australian Journal of Botany 52(3):417–424. Sawadogo M, Ouedraogo JT, Zangre RG, Balma D. 2005. Diversite biologique agricole et les facteuure de don maintien en milieu paysan. In: Balma ED, Sawadogo M, Zangre RG, Quedraogo JT, Jarvis DI, editors. Lagestion de la diversite des plantes agricoles dans les agro-ecosystemes. Compte-rendu des travaux d’un atelier abrite par CNRST, Burkina Faso, 27–28 December 2001. International Plant Genetic Resources Institute, Rome. Schneider J. 1999. Varietal diversity and farmers’ knowledge: the case of sweet potato in Irian Jaya. In: Grain G, Fujisawa S, Warren MD, editors. Biological and Cultural Diversity. IT Publications, London. pp.97–114. Schultze-Motel J. 1987. Numerisch-taxonomische Studien and Triticum L. and Aegilops L. zur Theorie der Klassifizierung von Kulturpflanzen. Kulturpflanze 35:53–97. Second G. 1984. A new insight into the genome differentiation on Oryza L. through isozyme studies. In: Sharma AK, Sharma A, editors. Advances in Chromosomes and Cell Genetics. Oxford and IBH Publishing Co., New Delhi. pp.45–78. Sharma SD, Shastry SVS. 1965. Taxonomic studies in genus Oryza L. IV. The Ceylonese Oryza spp. affin. O.officinalis Wall ex Watt. Indian Journal of Genetics and Plant Breeding 25:168–172. Sigeta M. 1995. [A case of man-plant relationships: enset cultivation and utilization of the Omotic Ari in southwestern Ethiopia]. Kikan –Jinruigaku 19(1):191–271. Simmonds NW. 1966. Bananas. 2nd Edition. Longman, London. Simmonds NW, Weatherup STC. 1990. Numerical taxonomy of cultivated bananas. Tropical Agriculture 67:90–92. Singh SP, Gepts P, Debouck DG. 1991. Races of common bean (Phaseolus vulgaris L., Fabaceae). Economic Botany 45:379–396. Šmaraev GE, Korovina ON, editors. 1982.Kukuruza (Corn). In: Brežnev DD, editor. Kul’turnaja Flora SSSR. Vol. 6. Kolos, Moscow. Soleri D, Cleveland DA. 2001. Farmers’ genetic perceptions regarding their crop populations: an example with maize in central valleys of Oaxaca, Mexico. Economic botany 55(1):106–128. Stankevič AK, Rep’ev SI. 1999. Zernobobovye kul’tury (Grain Legumes). Kulturnaja Flora, t. 4. Saint Petersburg. Styles BT, editor. 1986. Infraspecific Classification of Wild and Cultivated Plants. Clarendon Press, Oxford. Tanksley S, McCouch S. 1997. Seed banks and molecular maps: unlocking genetic potential from the wild. Science 277:1063–1066. Tanto T. 2001. Unpublished data presented at an international workshop “Strengthening the Scientific Bases of In-Situ Conservation of Agricultural Biodiversity: Genetic Diversity and On-Farm Conservation Workshop, 11–19 June 2001, Ouagadougou, Burkina Faso. Tateoka T, Pancho JV. 1963. A cytotaxonomic study of Oryza minuta and O. officinalis. Botanical Magazine, Tokyo 76:366–373. Tesfaye B, Ludders P. 2003. Diversity and distribution patterns of enset landraces in Sidama, southern Ethiopia. Genetic Resources and Crop Revolution 50:359–371. Teshome A, Baum BR, Fahrig L, Torrance JK, Arnason TJ, Lambert JD. 1997. Sorghum (Sorghum bicolor L. Moench) landrace variation and classification in North Shewa and South Welo, Ethiopia. Euphytica 97:255–263. Teshome A, Torrance JK, Baum B, Fahrig L, Lambert JD, Arnason JT. 1999. Traditional farmers knowledge of sorghum (Sorghum bicolor L. Moench) landrace storability in Ethiopia. Economic botany 53(1):69–78. Tomooka N, Vaughan DA, Moss H, Maxted N. 2002. Biosystematic background. In: Tomooka N, Vaughan DA, Moss H, Maxted N, editors. The Asian Vigna: Genus Vigna Subgenus Ceratotropia Genetic Resources. Kluwer Academic Publishers, Dordrecht, The Netherlands. pp.6–31. Vavilov NI. 1940. The new systematics of cultivated plants. In: Huxley J, editor. The New Systematics. Oxford University Press, Oxford, UK. pp.549–566. von Bothmer R, Seberg O. 1995. Strategies for the collecting of wild species. In: Guarino L, Ramanatha Rao V, Reid R, editors. Collecting Plant Genetic Diversity: Technical Guidelines. CAB International, Wallingford, UK. pp.93–111. Wang ZY, Second G, Tanksley SD. 1992. Polymorphism and phylogenetic relationships among species in the genus Oryza as determined by analysis of nuclear RFLPs. Theoretical and Applied Genetics 83:565–581. Xie ZW, Zhou Y, Lu BR, Zou YP, Hong DY. 1998. Phylogenetic relationship of genus Oryza as revealed by RAPD analysis. International Rice Research Notes 23:6–8.